The Mission District is a virtual outdoor art gallery full of vibrant murals. Throughout the neighborhood, hundreds of walls and fences are adorned with colorful works of art featuring themes ranging from cultural heritage to social political statements. Best viewed on foot, take a stroll over to these locations for an up-close experience and enjoy its nearby restaurants and attractions. Murals first appeared along Balmy Alley in the mid-1980s as an expression of outrage over human rights and political corruption in central America. Today, themes have expanded to include gentrification and government injustice. If you're looking for more arts and culture, the Mission Cultural Center for Latino Arts is located just a few blocks away. Along with a collection of exhibits, they offer a number of workshops in theater, music, and dance. 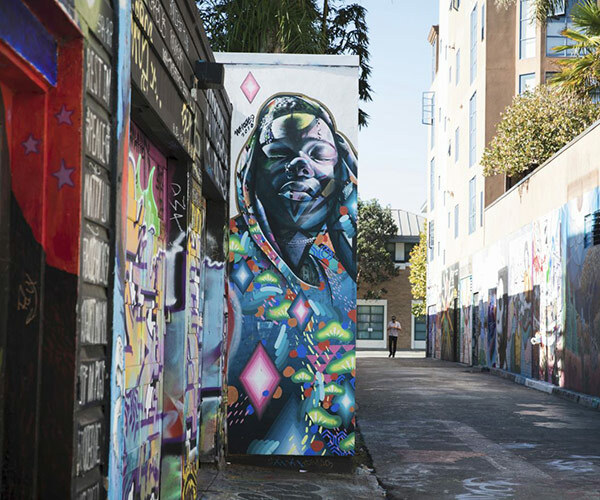 Inspired by Balmy Alley and other murals around the neighborhood, Clarion Alley is known for community and arts activities. This collection of murals reflects a variety of artistic styles and often depicts themes of social inclusiveness. More than 700 murals have been created since 1992, speaking to community concerns of social, economic, and environmental justice. For an equally inspiring view, pay a visit to Mission Dolores Park, where the sloping hills offer the beautiful sight of downtown's skyscrapers rising above the park's green grass and the Mission's neighborhood homes. Woods Cerveceria, a nanobrewery best known for their craft beer and sweet and savory empanadas, is also worth a visit when you're in the area. 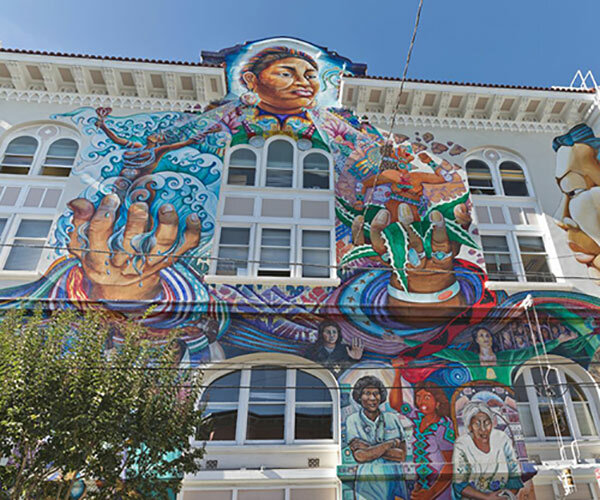 The Women’s Building is internationally recognized for its MaestraPeace Mural, which honors women’s contributions from around the world. Painted in 1994 across two walls, this mural is the result of multi-cultural, multi-generational collaboration between seven women artists. If collaboration is what you're after, then venture a few blocks down to Lazy Bear, one of the most sought-after dining experiences in San Francisco. Here, you'll get to talk to the chefs and learn how your unforgettable meal is prepared. 24th St. and South Van Ness Ave. Known as the “Golden Dreams of the Mission,” the Carnaval Mural located above the House of Breaks on the corner of 24th St. and South Van Ness Ave. is an impressive the 24 feet tall and 75 feet wide. Originally painted in 1983 by muralist Daniel Galvez with the help of local artists Dan Fontes, Keith Sklar, Jaime Morgan, Eduardo Pineda and Jan Sheild, the painting depicts the energy and spirit from the city's first Carnaval event in 1979. Keep Central Kitchen on your radar when in the area. Their California cuisine makes for a great spot for an evening dinner. Many people looking to explore the area murals come to the Precita Eyes Mural Arts and Visitor Center. It’s no wonder why; this community-based non-profit is filled with works by local artists and offers self-guided and guided tours that cover the murals' history, cultural and historical significance. If you're visiting this mural, you're also in for a sweet treat. Just across the street is Humphy Slocombe Ice Cream, a Mission District favorite scooping unique and seasonal flavors since 2008.